10 Best Wifi Hacking tools for Kali Linux Distro to try in 2019! Hack Wireless network passwords with ease! Kali Linux is a Linux distribution which has been made for Penetration testing and Digital Forensics. Mati Aharoni and Devon Kearns are the developer of this Operating System (OS). Now it is maintained by the Offensive Security Ltd. In this article we are not going to discuss the Kali Linux but, we are going to use it for Wi-Fi hacking. You heard me right we are going to discuss the Top 10 Free Wi-Fi Hacking Tools with the help of Kali Linux. In this article, we will be talking about hacking wireless networks and how to prevent your Wi-Fi network from getting hacked. Wi-Fi is a defenseless flank of the network when it is about Hacking a Wi-Fi network because Wi-Fi signals can be connected or picked up very easily by anyone at any place. The vulnerability can also be contained by routers which can easily be exploited with the use of efficient software and the right tools. Such right equipment and tools are included with the Kali Linux. Many of the ISP’s and router makers keep on the WPS by default which is making wireless security testing very important on their routers. With the help of these 10 Wi-Fi Hacking Tools for Kali Linux Wireless Hacking, you will be able your owned Wi-Fi Networks for all of the harmful security issues. I have also given some links which will help you a lot to get started and well-known by the tools. So let’s get started without wasting any further time. Also read: How to Find WiFi Passwords on Windows (Ultimate Guide) 2019. 12 Final Words – Which Wireless Hacking Tools are you using in Kali Linux? Now let’s discuss each of the list items with a brief explanation. Make sure to have Kali Linux installed if not have a look at our list of the best Linux distros for hacking. Aircrack-ng for wireless password cracking. Aireplay-ng to generate traffic and client de-authentication. Airbase-ng to configure fake access points. This suite is also available for Linux and is standardly available for Kali Linux. In order to use this tool the first thing, you have to make sure that is your Wi-Fi card capable of Packet Injection. Read: How to Hack Wifi Passwords in 2019 (PMKID Method). The second tool in our list is Reaver which is another very popular and amazing tool which is used for hacking the wireless networks and the specific targets with WPS vulnerabilities. Reaver is capable of performing the brute force attacks against Wi-Fi Protected Setup (WPS) PINs which is capable to recover the WPA/WPA2 passphrase. As many of the router manufacturers and ISPs keep WPS turned on by default and because of this a lot of routers are vulnerable to this attack. If you want to use Reaver you require good signal strength to the router of the Wi-Fi Network with a good and accurate configuration. This tool can also be used to recover the passphrase from vulnerable routers but this technique depends on the access point, signal strength and the PIN. So it means it is 50% of chances to hack the WPS PIN. Read: Kali Linux Hacking Tutorial for Beginners: The Definitive Guide. This is totally a whole new tool which is included within the Kali Linux and it is also capable of targeting the WPS vulnerability. PixieWPS is the tool which is written in C language and is used to make the WPS PIN offline and also to exploit the vulnerable access points. This is also named as a pixie dust attack. PixieWPS also requires a modified version of Reaver or it requires Wifite. This tool has become quite popular in a very little time. That’s why it is on number 3 of our list. It is a totally automated tool which s use to attack many multiple Wi-Fi Networks which are encrypted by the help of WPS/WPA/WPA2 and WEP. At the start of this tool, it requires some parameters to work with and all of the hard work will be done by the Wifite. This tool captures all WPA files, to mock your MAC address and to automatically de-authenticate connected clients. If we talk about one of the best network protocol analyzer tool then with Wireshark is the best. With this tool, you can analyze a network to see what is happening in complete detail. This tool can be used for capturing live packet and full inspection of protocols. On number 6 we have oclHashCat in this top 10 list. It is not a Kali Linux included Wi-Fi hacking tool, it can be used for dictionary attacks capturing while using a GPU. You can crack WPA handshake with the use of oclHashCat after using the Aircrank-ng suite. 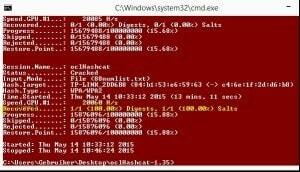 Your cracking speed process will be increased a lot by using GPU with oclHashCat instead of using CPU with Aircrack-ng. You can try about 50.000 combinations per second with oclHashcat using an average GPU (Graphics Processing Unit). This tool is available for Windows and Linux. It is also available for single GPU card developing companies (such as Nvidia and AMD). For Nvidia video cards the ForceWare 346.x or later and for AMD the Catalyst 14.9 is required to work. 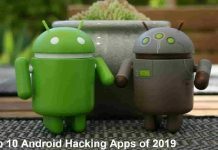 Read: 11 Best Wifi Hacker Apps for Android Mobiles (2019). This cracker is an attack tool and wireless security written in Python. Fern Wi-Fi Cracker is the GUI (Graphical User Interface) based dedicated Wi-Fi hacking tool. This cracking tool is able to recover and crack WPS, WPE and WPA keys and with this tool, you can also perform the MITM attacks. This tool can run on any distribution of Linux which contains the prerequisites. This tool is also included within the Kali Linux. Wash is the number 8 tool on our list. It is used to know that the targeted access point has WPS enabled or disabled. You can also use Wash to check if an access point is locked for WPS after a long number of attempts. A lot of access points are locked as a security measure when you are forcing to get the WPS PIN. Wash comes as a tool within the Kali Linux and it is also included with the Reaver Package. Crunch is a good and very easy tool which is used for generating wordlists which can easily be used for the dictionary attacks. As every dictionary attack depends upon the quality of the Wordlist used for the dictionary attack, you cannot stay away from creating your own wordlist. It is especially required if you are trying to create wordlists which are based on default router passwords. This tool can also be directly used with other tools like Aircrack-ng. You can save a lot of time with the use of this feature since you don’t have to wait until large password lists are been generated by the Crunch tool before you can even use them. So, the last but not the least tool in our list of top 10 Wi-Fi Hacking Tools is the Macchanger. This is a whole utility which can be used to spoof the MAC address and change it into any random MAC address or you can even change it to your own. So it will be very necessary for you to spoof your MAC address in order to avoid the MAC filters or even useful to hide your identity on a wireless network. It is nothing like a proxy or a proxy changer. It is a whole new level to keep yourself anonymous from all of the Web trackers which are always available to track the hackers. So, it is good to keep your identity hidden from all of these trackers. Note: All of the tools listed above work only in the command line (terminal). I would highly recommend you to read our 8 best Kali Linux Terminal Commands used by Hackers. Final Words – Which Wireless Hacking Tools are you using in Kali Linux? So that was all for today. I am not 100% sure if these techniques are totally secure so you must better be careful and before using any of these techniques use Macchanger and change your MAC address to keep off the trackers to track you. Before you go any further, make sure to secure your Linux server first. I have provided the download links for some tools from where you can download these tools easily. Some of them are already within the Kali Linux. I have provided other links through which you can learn easily to how to use these tools. That was all the information that I was able to gather for you. I hope this guide will be really helpful to you. Kindly share this with other people and also become helpful to them. 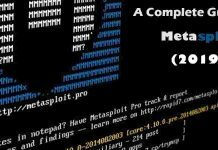 Metasploit Commands List (2019 Latest) – Use Metasploit like a Pro!